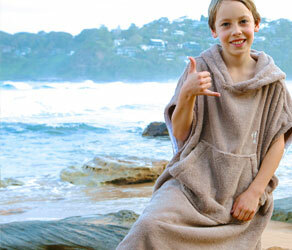 Our Towelling Surf Ponchos are smart, simple and so very practical for anyone who loves the water. Perfect for the beach, the pool, the lake or the water park. Easy to change under and so comfortable. On any given trip to the beach or poolside you will undoubtably see someone changing under a towel. Some people are better at it than others but for the most part it tends to be a bit of a fumble. Keeping the towel up while pulling your gear down! The biggest objective is usually avoiding flashing any random members of the public as you try to get changed. The towel change shuffle usually takes place behind a car door, behind a tree and sometimes right out in the open. As I mentioned, some are very good at it. They can chat and laugh along while discretely transforming under their favourite towel. Unfortunately we are all not so nimble. In essence a surf poncho is a loose fitting one piece garment that is designed to allow changing underneath – originally in and out of wetsuits – but suitable for any changing really. Think swimming costumes, dance and gym gear, lunchtime jogging outfits and even outfits changes for stage and screen performances. Designed with plenty of width and large arm holes, the wearer can comfortably slip their arms inside a surf poncho to get at the clothes that need changing. Ponchos are surprisingly simple and effective. Plus they can look smart and sporty. Terry Rich Surf Ponchos are both of these things but importantly also offer one more very practical benefit. They are made from high quality, thick and absorbent 100% cotton towelling meaning not only do they work as a cover-up but they also dry the wearer very effectively. In doing so they become a wonderful all-in-one garment for regular swimmers, surfers and many other water sports enthusiasts. Perfect for a trip to the beach, the pool, the water park or to take on holidays they are very practical for anyone who loves the water. One other very important attribute of ponchos is their sun protective qualities. All Terry Rich our surf ponchos are designed with over-sized hoods to ensure they offer maximum sun protection for the face and back of neck. This is most critical for kids and teens who are notoriously hard to hold down for sun screen application! • Designed & Made in Australia to the highest Terry Rich making standards. • Available in sizes kids, teen, small, regular and extra long. Until now most towelling ponchos have not worked particularly hard on their looks. They have been function first. Mostly in black, mostly a big baggy. The sort of garment most women would get into & out of as quickly as possible. We wanted to make something more appealing for women. Something that looked smart that women could use in public and feel good about wearing. When we got to the Zebra designs we looked no further. What a striking surf poncho these turned out to be. 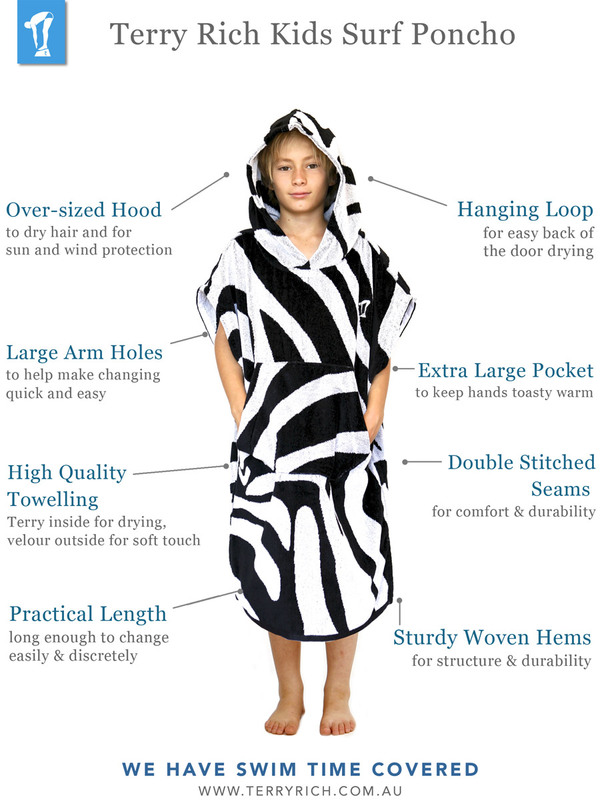 The fabric is thick & absorbent as per all Terry Rich Robes and Cover-ups – but with a fashion forward Zebra Stripe that just looks fabulous. No need to hide away in this surf poncho. Make your trips to the beach & pool a breeze with this versatile beach accessory that not only works wonderfully but also looks great. 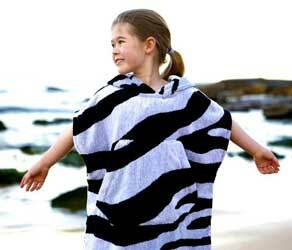 Available in three designs and in kids, teen & small sizing we have a surf poncho to suit all children. From the classic Charcoal to the lively Zebra and the Super Warm style for those children that really feel the cold. 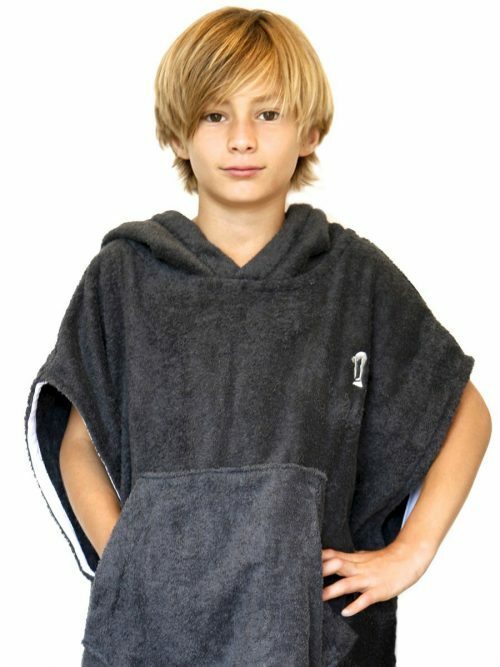 Surf ponchos are the perfect garment for kids that need to change on their own (at swimming training or carnivals for example) where they have not quite mastered the towel change shuffle and there is no parent hand to hold them steady! Do you know a man that loves to swim or surf? 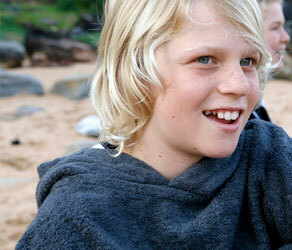 Terry Rich Men’s Surf Ponchos are tough and sturdy, made from thick & absorbent 100% cotton towelling. They are perfect for the man who loves to swim or surf and would love to do more of it, all year round and in all types of weather. Available in sizes Small, Regular and Extra Long and in two designs – the classic Charcoal and the Super Warm for extra cold conditions. 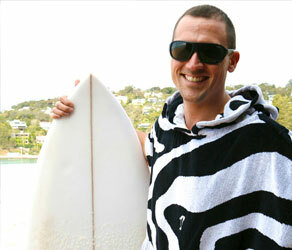 All Terry Rich Surf ponchos are generously sized to allow plenty of room for easy changing underneath. Please refer to the following size chart for measurements. If you would like to discuss sizing please email us at any time and we would be glad to help.